Giving Tuesday is the antidote to the massive consumer frenzy that is Black Friday and Cyber Monday. It is a worldwide day of giving, a day to do good stuff, a day to make a difference. It doesn’t matter who you give to, choose an international charity or a local one. It doesn’t matter what you give, whether you make a trip to a charity shop with some clothes from the back of your wardrobe or run a marathon for Cancer Research, whether you donate time or money, cakes or clothes. Giving Tuesday falls on the Tuesday after Black Friday and Cyber Monday. A lot of us Etsy sellers are getting frustrated with the pressure to have sales, especially around Black Friday and Cyber Monday. However, many of us already give to a charity close to our hearts and many of us raise money for that charity through our Etsy shops. Giving Tuesday gives us the opportunity to raise the profile of our charity work as a team. The great thing about getting involved as a team is we can all help to promote #givingtuesday and #glasgowetsy whilst still supporting our chosen charities. Whether it’s a percentage of sales/profit or a dedicated charity item in your shop, what ever you choose to donate, we just ask that this November, you share what you are giving on social media using the hashtags #givingtuesday #glasgowetsy and #GETgiving and, most importantly, make a donation to your chosen charity on Giving Tuesday! 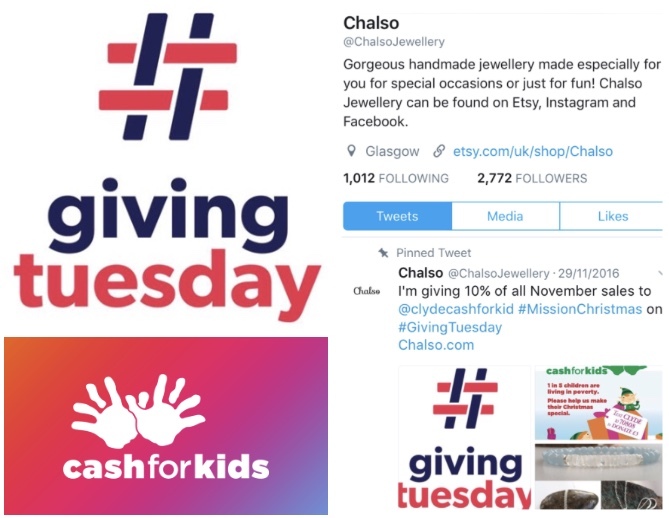 For example, last year, instead of having a Black Friday sale, Chalso donated 10% of November’s sales to Clyde Cash For Kids, making an online donation for most of the money raised on Tuesday 29th November (Giving Tuesday 2016) via the Clyde Cash For Kids website. If you want to get involved through your Etsy shop, we suggest using GETgiving as a tag on your Etsy listings during November. Also, at the beginning of November, add a line to your shop announcement about Giving Tuesday and what your shop will be donating. A form will be sent out to all GET members so you can let us know what you did and how much you donated on Giving Tuesday. We can then announce a team total just before Etsy Made Local! Giving Tuesday falls on the Tuesday after Black Friday and Cyber Monday, this year it’s the 28th November 2017. Let’s do this!